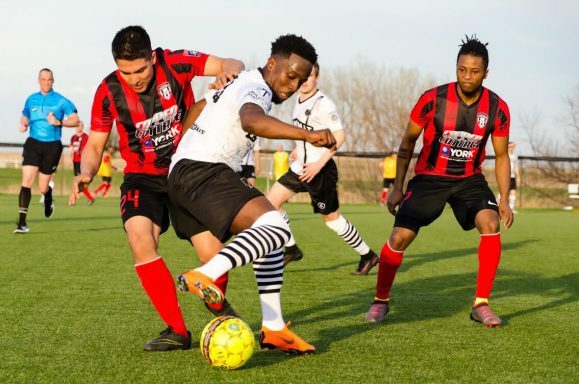 The first week of the NPSL North season featured just one game; Minneapolis City traveled to Sioux Falls for the opener and the Thunder earned a draw. The conference starts play in earnest with all eight teams in action next Saturday. The season’s soft open got off to a fast start as Michael Haight put Sioux Falls up a goal in just the 10th minute of the match, but City answered immediately. Tim Wills was fouled in the penalty area two minutes later and Nick Hutton put away the spot kick to knot things up. Whitney Browne’s hard work paid off in the 27th minute when he struck the back of the net to give the visitor’s the lead. Physical play led to nearly equal possession as the Thunder worked to even the game up. The 75th minute saw Manny Rosas Quiroz do just that. With the game tied 2-2, the Crows had set piece opportunities to steal all three points—including a late free kick that was headed just over the net—but time ran out and the spoils were shared.